Marleaux Bass Guitars from Clausthal-Zellerfeld, Germany created this Model M-12 custom 12-string bass in 2015. It was custom built for Roland Kaschube, the chief editor of Germany’s Bass Professor magazine. The bass incorporates a maple body with 3-piece maple neck and ebony fingerboard, 33” scale with 24 frets. Transparent black finish with actual silver inlaid in the body. Two Delano soap bar pickups with Marleaux 2-band electronics, active / passive. Controls are volume, pan, passive tone, and a double-deck bass / treble pot. Neck is just over 52 mm at the nut, 66 mm at the 12th fret. Custom ETS bridge, which took nearly a full year to develop. The new price of this 12 was 4,800 Euros. 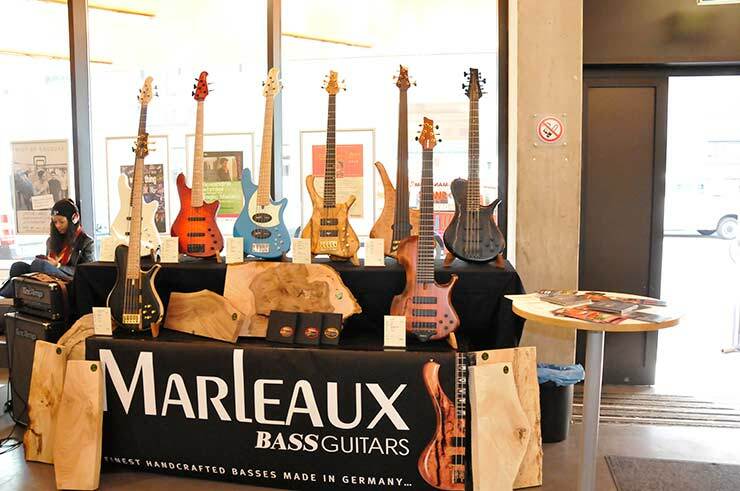 The Marleaux 12 was displayed at the “Feel The Bass 2015” show in Mannheim, Germany on October 11, 2015.